I have heard Jimmy Cliff in concert many times over the last twenty years, but I've never seen him give as powerful or joyful a performance as he gave at the WOMAD USA festival in Seattle. He took the stage by storm, beginning with "You can Get it if you Really Want It" and continuing for the next hour and a half, never letting up the pace with hit after hit. From the first song, he had the audience in the palm of his hand. While watching the show from backstage, a member of Los Lobos, the next band scheduled, said to me "It looks like a lot of people out there are having religious experiences" Cliff exuded joy, power and love from the stage, demonstrating a natural and intuitive giving and taking of energy between performer and audience. It was truly one of those rare concerts everyone hoped would never end. After his time had run out, with roadies trying to wave Cliff off stage, telling him there was no time for an encore, he returned alone with his conga, singing "Rivers of Babylon", "Congoman" and "Armagideon" before finally finishing his set. I met Cliff in his trailer after the show where he was relaxing with his wife and three daughters who he was taking out on the road with him for the first time. He shook my hand, then his face broke into a huge grin as he plucked at my t-shirt with its Hindu "Om" symbol batiked onto it. 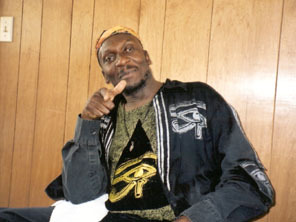 Jimmy Cliff: Your t shirt says "Sai Ram" Did you hear me saying "Oms" from the stage? Jimmy Cliff: Ommmm. The sacred sound. D: That was the summer of 1981, just after Bob Marley died. A lot's changed since then, but over the years your concerts seem to get more powerful. The audience really reacted strongly to the performance you just gave. JC: Yeah, you know because I am evolving. Evolving spiritually. Getting more strong spiritually. Yeah, I am aware that I am having more effect on my audience. Yeah, I am feeling, I know I am getting stronger. D: Yeah, you truly seem to have more energy now than ever. How has that happened? JC: Growth. It is growth. It is experience you know. As my grandmother used to say, I use this term, not such a cool term for Americans, but I use it because in our culture we respect age, so my grandmother say, "the older the moon, the brighter it shines" Y'see, so , it's like that. And every day I know I learn something new about myself and I am perfecting my art more and I am learning a lot more, so you know , the more I know, the more powerful I become. JC: I come from childhood like this (pointing to his three daughters) to manhood, huh! Now I am in a stage of Godhood. You see, that's how it goes. D: Do you feel liberated? JC: Absolutely. Absolutely. You know, now I know that I am in God and God is in me. I don't look anywhere outside of myself for God. I know where God is now. This is a different stage, a different level. You know, you pray to Jesus, or you pray to Buddha or .... Now, I become one with the all. D: You sing about armageddon. Do you believe in a literal end of times, or is it more something inside each of us? JC: Both ways. The armagideon is both individual and on this planet. You know, look what we have done to the planet, what human kind has done to the planet. It's the law of cause and effect, so what we have done has had an effect. So, the armagideon will come individually and it will come collectively. JC: You know, justice is something where....It has to take place you know. If you do something to me and I forgive you, justice still has to take place. JC: It's not enough, but I ease the pendulum, you know, but justice will still have to take place in some way, but I can help you so you get your justice with more mercy and you feel okay, better receiving it than if it was the other way. So, how can we prevent it. We can do certain things to stop certain things, but what has already been done will have its effect. D: So, what do you teach your children to ease some of this, alleviate it? J: I am teaching them primarily to understand that God lives in them and not to look outside of themselves for God. D: Is the God they see in themselves the same God you experience? JC: Same God. Energy. God is energy. In our ancient culture, we call God the all. I am in the all and the all is in me. So, that is energy. D: "Nothing shall be added"
D: Where you going to put it? JC: Yeah, it's like that. D: Is music a transmission of this? Do you bring it across to your children this way? JC: It is one way because children are children and we have our duality side of us ... They will fuss with each other, but through music I can bring them all together. I have done it on stage with them sometimes. D: I really enjoyed their dancing. Do you always travel as a family now? D: (to Jimmy's youngest daughter) Do you want to do what your daddy's doing? Daughter 1 : It's kind of hard. I have to think about whether I really love it, but I think I want to be a doctor. Daughter2: I think I would like to be a singer, but maybe a doctor first. D: Two doctors in one family! Daughter 3: I want to be a doctor, too- if I can't be a singer. D: Well, the music was like medicine.... Do you think music has a healing quality? D: Do you still love performing? D: What do you do when you're not performing? Daughter 1: You never swim with us daddy. JC: Ha Ha Ha. Not in the pool. Don't like the pool. I love the beach huh! The ocean. Natural Man. D: It's been a pleasure.